Years ago, in my final year of convent school, the nuns brought us girls to Rome to see the Pope. We duly visited the Vatican, but were more interested in the Italian boys who swarmed around our bus as we went sightseeing. When we had the chance, we replied to their tentative English in Gaelic, our dying native language an obligatory subject on school curricula. The boys’ consternation was satisfying because they didn’t understand a word we said, but also off-putting because they believed Gaelic was English spoken with a funny accent. When, after our Roman week, we disembarked from the boat at Dun Laoghaire—back then airline deregulation still hadn’t happened and low-cost Ryanair still hadn’t overtaken European skies—my aunt who came to meet us told me a nun kissed the ground in thanksgiving we were all back safely on Irish soil. But that could have been a tall story, my aunt was good at those. The point of this longwinded introduction is to explain that, being bilingual, translation becomes an automatic process. A similar switch occurred when I moved to Rome—a good many years after we nearly gave that poor nun a heart attack—and the inner translation chip switched to English/Italian. (By then the Irish language had become a lost one to me because I wasn’t speaking it anymore.) Learning Italian was like scaling Vesuvius: a tough trek with plenty of hard rocks to stumble on while climbing. A great big boulder was the Italian for “beyond,” would you believe actually three separate words with a crazy back translation meaning “at the of there.” When I’d achieved some level of competence—and al di là didn’t seem quite so crazy any more—I was ready to read two favourite authors translated into Italian. What better way to get to the top? L’avessi mai fatto! (“It if I had never done!”) Hercule Poirot’s pate was still egg-shaped but it was a different kind of egg, his conversations with Hastings didn’t seem half as amusing and, worst of all, he failed to straighten the objects on his desk with the same finicky precision. Reading translations of the second author’s tales was an even greater disappointment, not a shiver did I feel. The House of Usher seemed deprived of its silent decayed menace, the fine subtlety of luring Fortunato to the Amontillado was absent, and the horror of the swarming rats and swinging pendulum didn’t penetrate through to my bones. I persevered, but couldn’t get rid of the feeling I was being cheated, robbed of an important part of my late childhood and teens. In the end, I decided I wasn’t having any more of this until I had a better knowledge of Italian and went back to the real thing. In the opening lines of “Berenice” I found consolation. “Misery is manifold. The wretchedness of earth is multiform.” What had been stolen was returned to me. But there was also a downside, because that pesky chip in my head had me picking up pencil and paper. Dare I? I dared. Translating the first sentence into Italian, I wrote La miseria é molteplice. It didn’t look too bad. But on second thoughts, miseria wasn’t quite the right word, referring as it does to material poverty rather than to woe and despair. Also, the phrase Porca miseria remains a pretty strong expletive, so to avoid the association, I needed a substitute word to maintain the sense of inert despondency. I came up with ‘anguish’, perhaps closer to the author’s intentions, and quite liked the sentence that then read L’angoscia é molteplice. But it lacked the dirge-like music of the original, maybe because the lovely alliteration was lost. To restore the figure of speech, I tried L’angoscia è abbondante, but it looked so grammatically awkward, I was sorry I’d written it. Twisting it around to Abbondante é la mia angoscia provided a more poetic tilt, but one that drifted away from the author’s intentions. I left the problem aside to simmer and passed on to the second sentence. It seemed easy enough; L’abiezione della terra é multiforme. But was abiezione, ‘abjection’ quite the right word? I didn’t think it was, so it was clearly time to scrunch up the paper and throw it away and that’s what I did. It’s easy to see that translators have a tough time of it, not least of which is getting over the lost in translation obstacle; a painful one because, more often than not, it just can’t be done. This came to mind recently while working on an Italian to English translation of a documentary, which included reference to a 1949 film, a classic of Italian neorealism. The film, Riso amaro (in Italian following capitals are dropped) starred Silvana Mangano as a worker in the rice fields of Northern Italy. In English, the title became Bitter Rice, a literal translation and a good one—except for the lost pun. Riso also means laughter and Bitter Rice, Bitter Laughter, although appropriate to the scenario, wouldn’t have sounded half as good. But the greatest difficulty is the decision translators are faced with at the start; whether to opt for fidelity to the original text or discard fidelity in favour of style and current tendencies. In France in the 17th century, the phrase Les belles infedèles, literally ‘the beautiful unfaithfuls’, was coined to express the concept. Vincenzo Monti (1754-1828), Italian scholar, poet and translator, was criticized for his faithless Italian translation of Homer’s Iliad. Monti’s reply to the scorcher was “Preferirei una bella infedele ad una brutta fedele.” In French and Italian the adjectives ‘belle’ and ‘bella’ are also nouns meaning ‘beautiful woman’, and Monti’s preference for a ‘beautiful unfaithful’ over an ‘ugly faithful’ for many translators is the only way to go. It was true that Monti’s knowledge of ancient Greek was imperfect so that instead of working from Homer’s original text, he referred to later Latin translations. Nonetheless, his interpretations imbued Homer’s Trojan War epic with a new poetic unity so that even today, Monti’s Iliade is the one that wins all the kudos. I often wonder how writers like Conrad and Nabokov were able to write so many works of fiction in a language not their own, but I suppose that’s genius. Conrad preferred to write in English rather than in his native Polish, while Nabokov wrote in Russian (that confusing Cyrillic script) and later took to writing in English. Swiss tennis player Roger Federer switches from German, to French, to English and back to German again quicker than it takes him to serve an ace, and he never seems never to stumble. Maybe the agony starts when getting to write down the words and stringing the sentences together. From my schooldays, I remember a teacher complaining that with all the English and Irish, we’d end up unable to write and spell properly in either language. And she was right. The trickiest words to get around are those insidious little prepositions: to, from, at, etcetera. In other words, the al di là conundrum. As for my spelling, not to mention the hybrid Italian-English words that keep popping up all the time, I can only exclaim Che figura! (and sometimes Porca miseria) while engaging in heated battles with my computer’s automatic corrector I’m very grateful to lose. 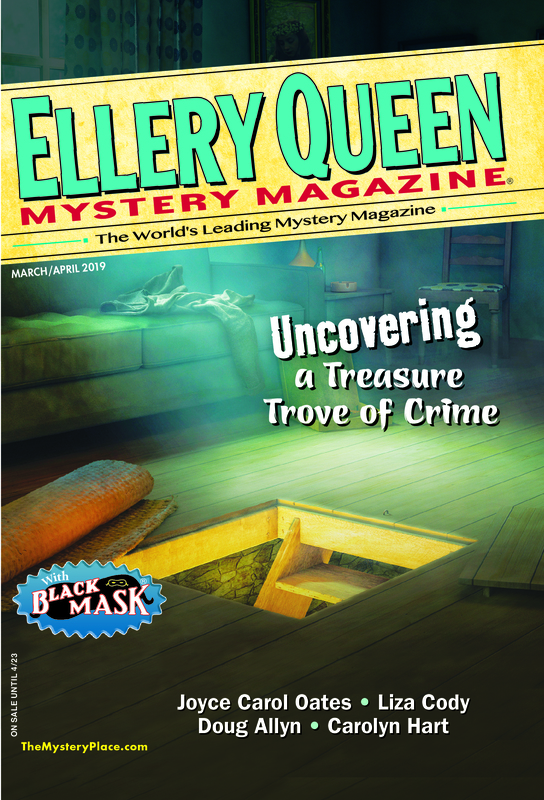 I always read with great interest the “Passport to Crime” stories on EQMM and wonder how each story was in the original language. If I know it, I sometimes try to see if I can pick up some clue from the phrasing and get back to the original sentence. One of my favourite “Passport” stories, published in the November 2013 issue, was written by Raphael Montes and translated by Clifford E. Landers from the Portuguese. It’s a language I don’t know, which luckily deactivates that wretched chip. Statement No. 060.710-67 is the perfect short story and, I’m willing to bet, a beautiful faithful. This entry was posted in Books, Guest, International, Passport, Readers, Translation, Writers and tagged crime, english, gaelic, international, italian, language, reading, translating, translation, words. Bookmark the permalink. I’m always interested in hearing/reading what translators have to say about their art, Olive-Ann, and I very much enjoyed your post. Thanks! This is fascinating! Thank you, Olive-Ann. I’m trying to learn more French than I did in school. As part of my self-teaching I place a French translation of one of my books next to the same book in English. First I attempt to translate a French page of it back into English and then I check the original English edition. It’s eye-opening to note the subtle differences. So far I’m not judging or criticizing. Just noticing. Eventually maybe I’ll get enough of a feel for the variations to be able to tell if it’s a good translation or not. So far, I think it is and I feel fortunate that is so. I love that you take such care with your translations! It was a pleasure to read your response, Nancy, and what a wonderful way to brush up on French! As a great admirer of your work, may I wish you belles fedèles all the way.